FINALLY, after many years of work including touring numerous film festival screenings, a few awards, and distribution on various television networks, the Disarm DVD has been completed!!! This newly mastered DVD, with new artwork, is loaded with extras including directors' commentary, trailers, and 40 minutes of deleted scenes. 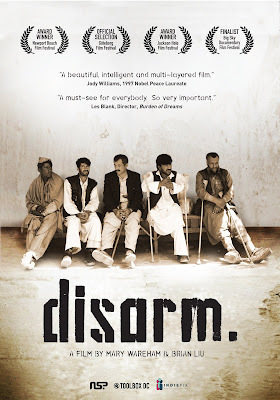 Our amazing friends at IndiePix will start distributing the Disarm DVD on February 24th launch event is planned in New York on March 2nd together with Nobel Laureate Jody Williams, the International Campaign to Ban Landmines(ICBL), and special guests. The DVD will be available from stores in Canada, the US and UK, and online at Amazon, Netflix, Borders Books, and via digital download. PLEASE buy the film, spread the word, and PLEASE PLEASE add to your Queues and your wishlists and leave comments and star ratings on the Disarm profile on Amazon, Netflix, and IMDB sites. Thanks to so many people who have helped us, donated time, provided resources, or kept us safe during the making of Disarm. Please support independent film and help support the bans on landmines and cluster munitions. A big thanks to everyone involved in preparing the DVD especially Mary Wareham, Brian Liu, Guillaume Bernadeau, Amy O'Byrne, Nick Pimentel, Katy Wood, and our translators. We're grateful to IndiePix, especially Danielle DiGiacomo, Liz Ogilvie, Matt Posorske, and Ryan Harrington. The New York event (sold out) flyer is available here. can i buy this outta someone's trunk? because that'd be cool. Well-done and moving documentary on one of the most devastating leftovers of war from all over the globe.